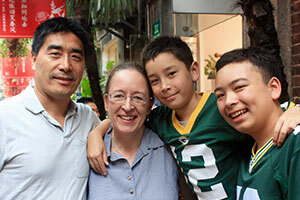 For UW Department of Family Medicine and Community Health (DFMCH) residency alumna Laura Jordhen, MD (Madison ’04), being a family physician in China adds a new dimension to her career and offers exceptional opportunities for her family. Dr. Jordhen joined the staff of Shanghai United Family Hospital (UFH) in May 2016, after chairing the Department of Family Medicine at Portland Adventist Medical Center in Vancouver, Washington, for four years. Nearly a year later, her husband Lhalung, who is from China, and sons Tsering, age 14, and Sangye, age 11, received their visas and joined her. At UFH, Dr. Jordhen provides outpatient care for people of all ages. Some of her patients are international families who live in Shanghai; others are Chinese. The hospital’s primary languages are English and Mandarin; nurses help with translation. Dr. Jordhen (center) and her Shanghai UFH colleagues. Dr. Jordhen is also on the faculty of UHF’s three-year family medicine fellowship for Chinese physicians—and was named its Teacher of the Year in 2016. That fellowship is modeled after a U.S.-style family medicine residency, although participants have already completed residencies and many have already been in practice in other specialties. Dr. Jordhen explains that this is because the concepts of family medicine and evidence-based medicine are new to China. Traditionally, community-based general practitioners in China see up to 50 patients per day. They can treat the presenting symptom, but may not have the time nor training to develop differential diagnoses or address multiple problems. “We work closely with our fellows to incorporate whole-person care, preventive care and an understanding of the impact a condition has on a patient’s life and function,” she says. The Jordhen family together in Shanghai, from left: Lhalung, Laura, Sangye and Tsering. Living in Shanghai also makes it easier to maintain connections with Lhalung’s family. Since their arrival, Tsering and Sangye have gone to school in Shanghai, and their cousin shares the family’s apartment. Tsering and Sangye also spent the summer in Qinghai province in western China, where their father was born. They visited extended family and practiced speaking Tibetan, their father’s native language. Dr. Jordhen is now halfway through her three-year contract at UFH. In August, she was named a top 10 physician in Changning District, Shanghaim, by the Changning Health and Family Planning Committee. Eventually, she and her family will need to decide when to return to the U.S. But for now, they are enjoying life in China—and Dr. Jordhen encourages other family doctors to consider similar opportunities. Great work, Dr. Jordhen, and thanks for keeping in touch! 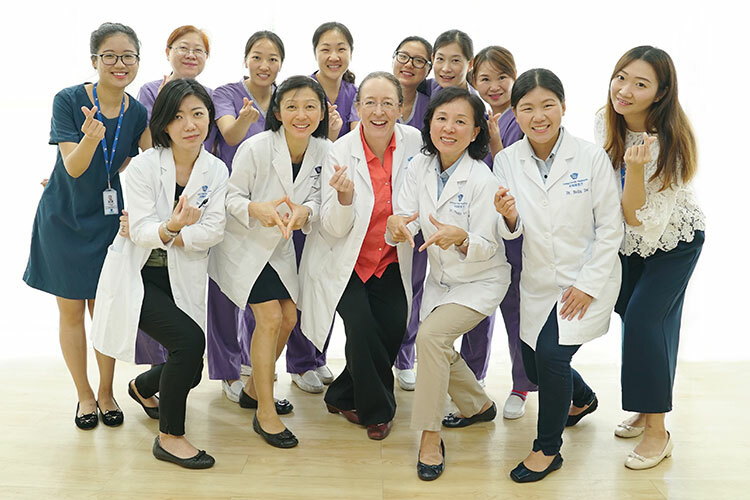 Since 2004, the DFMCH has had an educational exchange program with the Yuetan Community Health Services Center affiliated with Capital Medical University in Beijing. The program brings together DFMCH faculty and Chinese general-practice (GP) physicians, public health experts and other health professionals. They share principles of family medicine education and practice with the goal of further developing the discipline in China. 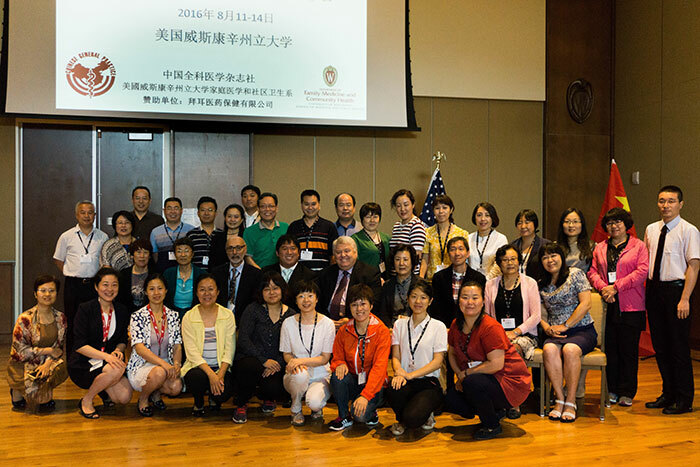 In August 2016, the DFMCH welcomed a delegation from China for the first U.S.-China Symposium on Family Medicine and Community Health. For more than half of attendees, this conference was the first opportunity to directly interact with U.S. family physicians. The Chinese delegation at the symposium with the DFMCH’s Ken Kushner, PhD; Richard Roberts, MD, JD; and Wen-Jan Tuan, MS, MPH. Xueping Du, MD, director of the Yuetan Community Health Services Center and an internationally respected Chinese GP and medical educator, said the conference improved participants’ clinical skills and advanced their overall service capability. She added that the exchange program played a critical role in her becoming the first Chinese GP to receive the World Health Organization’s Sasakawa Health Prize for outstanding innovative work in health development. We want to keep in touch with you! Please update your information at our DFMCH alumni update form.